There is an undertone to this blog and my writing that I have not outright addressed before. It is the fact that most of my hunting and outdoor adventures occur alone. I have never been opposed to hunting without a partner, but truth be told I enjoy the solo adventures often more. There is a sense of accomplishment and understanding of nature when you are alone in the field. You have to rely entirely on your own wits, skills, and instincts for your hunting and safety. Don't get me wrong, I do enjoy other hunters' company and help, but there are times when one needs to simply be solitary to hear their inner voice and reflections. I had spent the first four days of my trip to Alaska hunting with both my father and mother. All of us had successfully taken caribou with rifles. 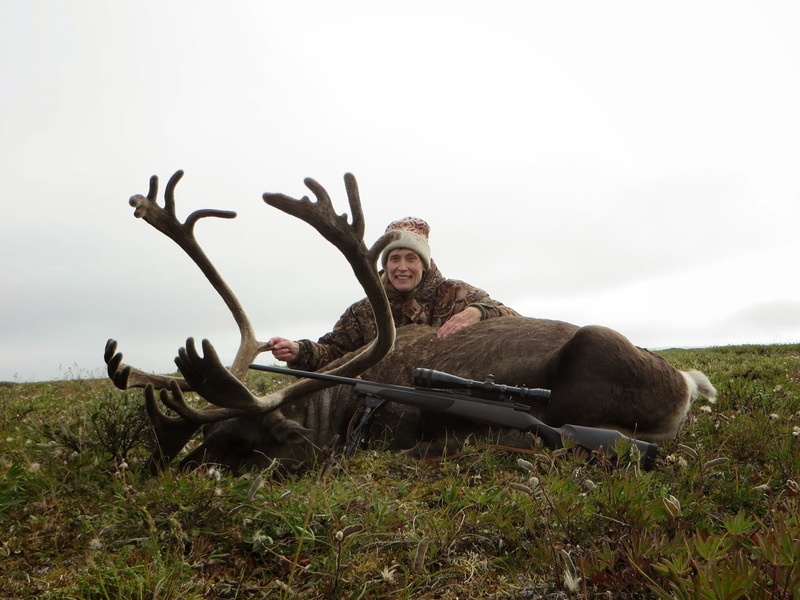 Mom had even shot two caribou in the same herd, after we had completed a mile long stalk on the group of bulls. For the last 300 yards we crawled through the tundra to finally arrived within rifle range. I was also with Dad when he shot a very nice bull with his rifle after I had failed to get within longbow range of the beast before being spotted. The time had come to give traditional archery caribou hunting the best attempt I could before my time on the Alaskan Tundra ended. To do this I knew I needed to be alone to minimize scent, sound, and movement. 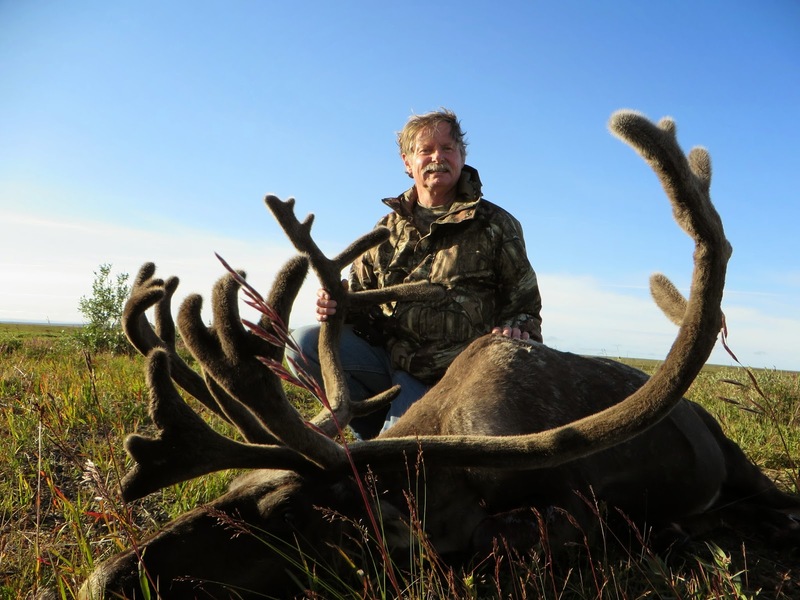 There are two basic ways to get within 30 yards of caribou: the stalk, and the ambush. Caribou graze at 3-7 MPH and are in constant motion as a herd. To ambush them, the hunter needs to stay well hidden in the front of the herd and wait for them to pass by, hopefully within bow range. 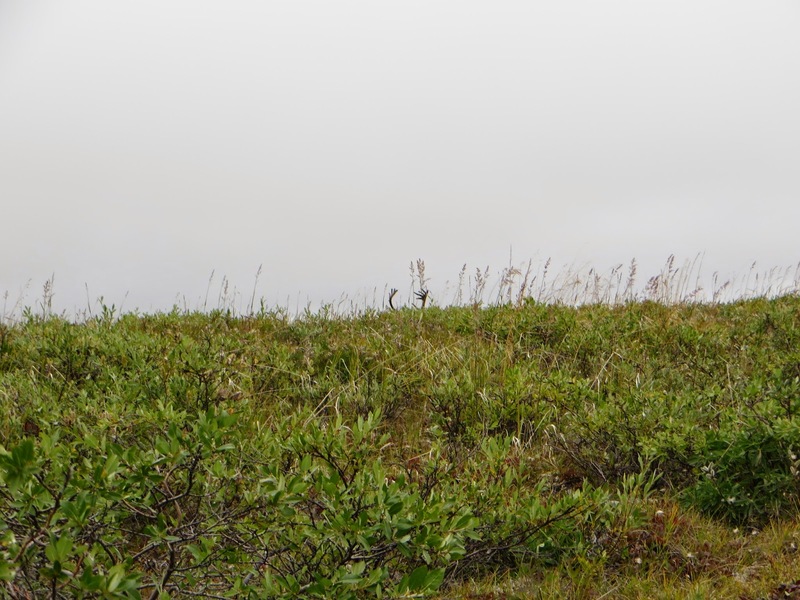 It can be very helpful to sit where one group has already passed, as the next herd will take this same path based on the scent of the previous caribou. The stalk is best done on a herd that is bedded with some object of cover nearby to approach from. 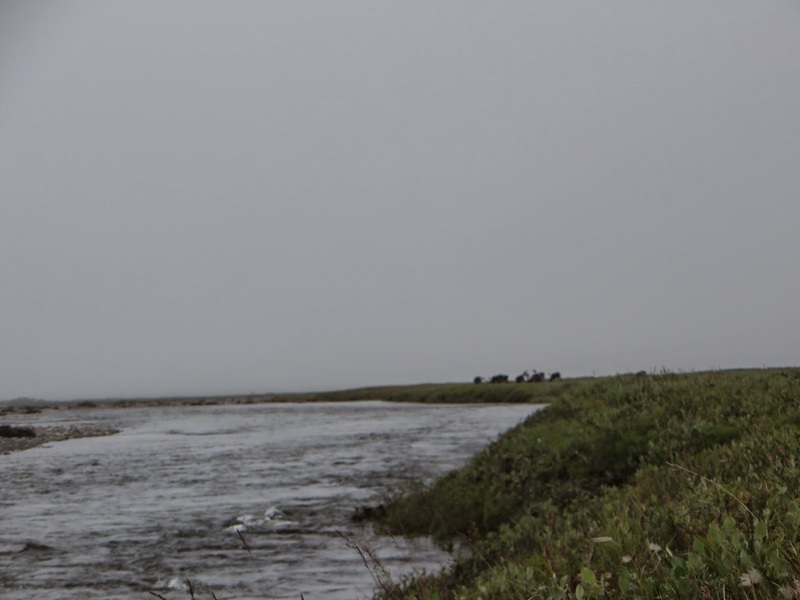 With both of these tactics in the forefront of my mind I set off from camp alone, walking along the Kavik River. My plan was to use the concealment of the river bank for ambushes or to launch possible stalks from. After several miles of walking, I found that I was positioned in front of a herd moving towards the river bank. I made sure I was directly in place of where they appeared to want to cross the river. With high hopes and rising heart rate I waited for the caribou to arrive in bow range. All of my dreams were dashed when 300 yards out the bou started running, paralleling the river rather than crossing it. At first I could not figure it out, everything was perfect; the wind was in my face, I was well hidden, and I had not moved. Then I saw the wolf. It was the same big blond wolf I had seen several days earlier. The wolf was chasing the bou, as he too was hoping to drag down one of the tasty ungulates for a meal. His attempt was only half-hearted and did not end up in either of us scoring a caribou. I still could not have anything but admiration for this predator. It was the last wolf I would see on the trip and the view was worth the lost opportunity. Using my binoculars I found the entire tundra was stacked with small herds of Caribou feeding in my direction, but still several miles away. I set up to ambush one group that had the largest bull I had seen as its leader. I was further excited when this herd bedded down 600 yards away from me. They had chosen to lay down 50 yards from a group of willows that gave me a chance to approach them downwind and unseen. For the next hour I crawled and crab walked the 600 yards to the willow bushes. When I arrived I found that a small stream separated me from the herd. I had to wade very quietly through the cold water, flooding my boots for the rest of the day. I was still not close enough for a shot and decided to use a small rise to belly crawl half the distance to the big bull. When I was 25 yards away I could go no further. It was time for the shot. I knocked an arrow while laying on my back. My plan was to wait for the bull to rise from his bed, then I would slowly sit up while drawing the bow and take my shot. After 15 minutes of waiting it became tedious to just lay there, but I decided to wait rather than push a bad shot. The wind abruptly shifted and I knew it was over. The wind carried my scent to the bedded herd and they rose and quickly ran away, out of bow range. It was difficult to come so close and then at the last minute lose it all. With determination I set up for a final ambush attempt on the next herd feeding towards the river. From watching where previous groups had passed I knew where they would cross one particular set of willow bushes. I secreted myself in the clump of green, in a way that offered several great shooting options in different directions. I watched with anticipation as the group of all bull caribou approached my hide. The lead bull crossed the willow line 30 yards from where I was and then walked out to 40 yards and stood broadside. This was it. I knew they were not going to give me a better shot. 30 yards is the furthest I felt comfortable shooting at an animal with my longbow, although in practice I have shot 40 yards decently before. My hunting ethics took over, and I decided there was just too great a chance at wounding the bull and not making a clean kill. I had to let the bull walk. It was a hard choice, as I knew he would soon be directly downwind and the hunt would be over. True to prediction, 20 seconds later the bull signaled the alert with a raised tail and a snort, and ran back to the approaching herd. While they never saw me, the entire group gave a wide girth to my group of willows. 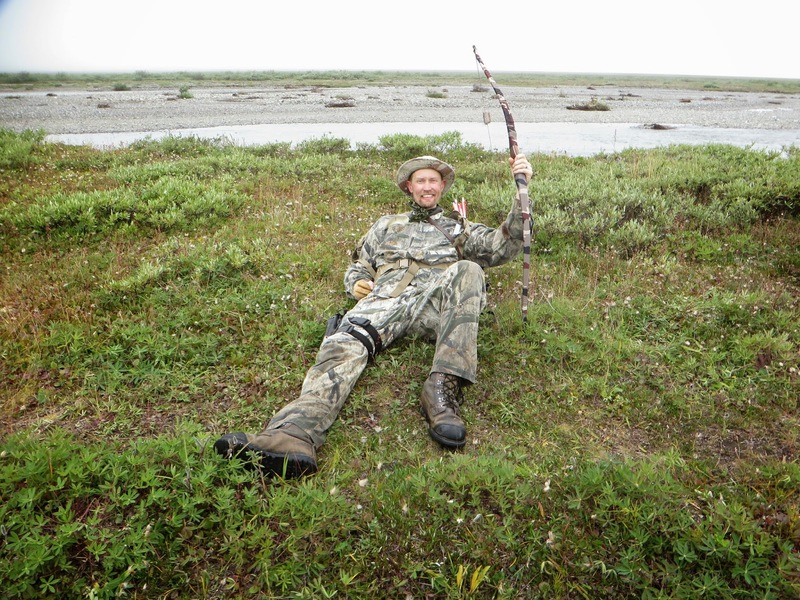 As I started the 3.5 mile trek back to camp I thought about the day and what I had learned about bow hunting caribou. I had spent 5 days carrying the wooden bow and arrows around the tundra in pursuit of the bou. Each day and stalk had put me consecutively closer in both knowledge and physicality to that realization of this dream. I had one hunting day left in Alaska, and a decision to make: continue to hunt with a bow and possibly take home an empty $325 tag, or break out the AR10 and fill that tag with another caribou. I knew in my heart if I had another 3-4 days of hunting I could make it happen with a bow, but with how unpredictable the bou had been in their passing I could not risk it all on one day. The following morning would find the 308 on my back and ready for action, after sitting on the sidelines for the entire trip. 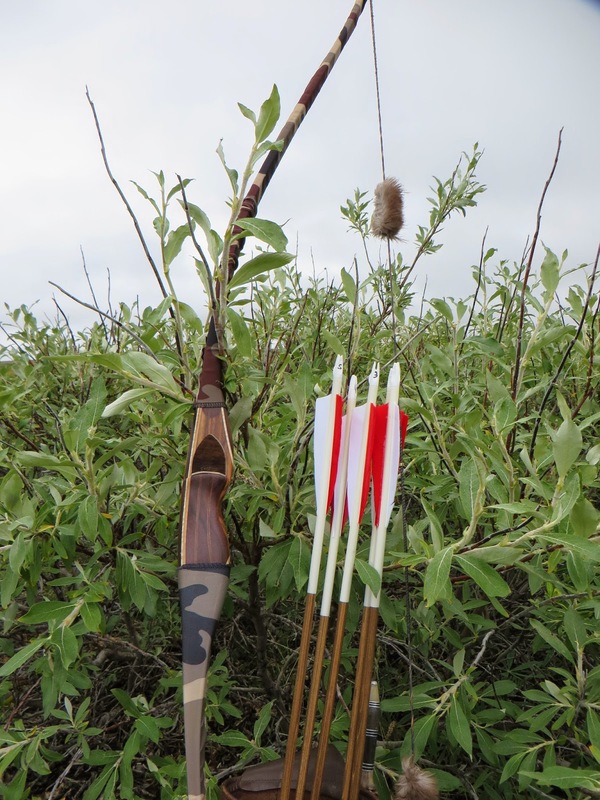 I had come to Alaska with dreams of taking a caribou with my longbow. Those dreams have at least diminished for now. I spent some time thinking about how much the caribou had taught me about themselves. If I had used a rifle for both tags right away, I would have been finished on the first day of the hunt. 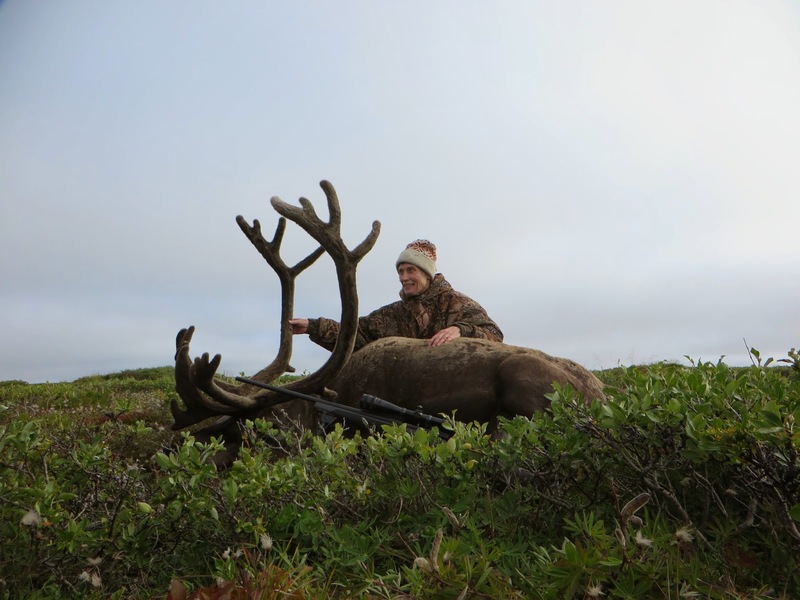 Setting out to take a Caribou the hardest way possible was the best thing I could have done. The five days and specifically the day spent alone, crawling, walking, stalking, and hiding had made Alaska my caribou classroom.